Walk into the home of any Lexington School family past or present and you’ll probably see a copy of Pinpoints magazine lying on the coffee table among other “soon-to-read” items, ones that last beyond today, beyond just this minute. 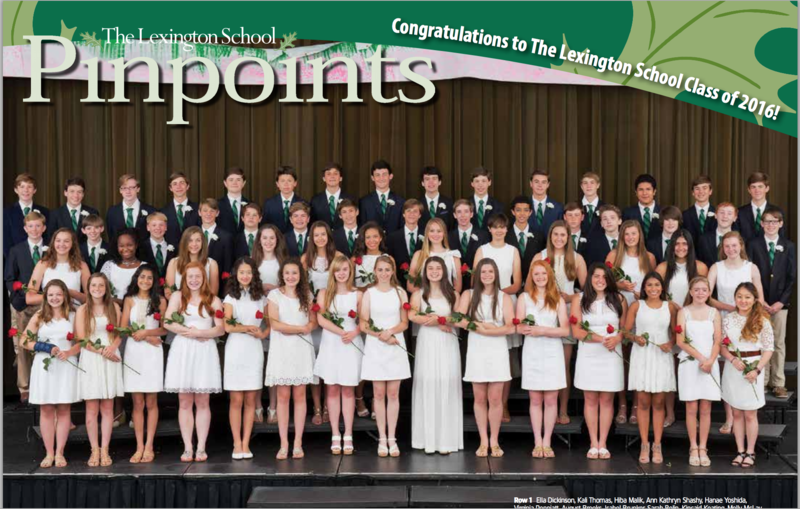 Yes, print is alive and well at The Lexington School because Pinpoints defines a great school magazine. Three times a year, editor extraordinaire Lucy McKinstry covers the nooks and crannies of The Lexington School’s past, present, and future with articles and pictures that range in size, shape, and story. Even in today’s digital world, Lucy manages that delicate balance as she chooses stories with longevity in mind. What she covers will last. She is part reporter, part historian, but all of what she shows us remains relevant long past the daily news cycle of even this blog post. Commencement news including Tulani Grundy Meadow’s fantastic address. A 38-year history and tribute of Marijo Foster featuring generational perspectives. Professional development goes west to the Oregon Trail. Physics to Photography, academic examples of more student-centered learning. But take your time. Leave it where you sit to drink your coffee each morning, where you can relax and read and enjoy seeing some people you haven’t seen in awhile. That’s how print feels different. It’s in your hands after all. Pinpoints is a celebration of The Lexington School’s complete community, and it is worth the read. Download it; enjoy it. It tells the story of who we are in only the way Lucy knows how–through the lens of the people and pictures and the MOST readable prose.